COMMENT: You have no proof that Obama briefed Hillary. You are just supporting Trump. 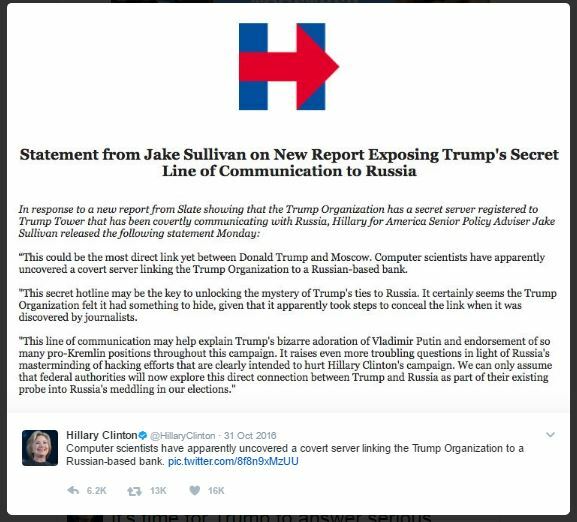 REPLY: Here is Hillary’s Tweet dated October 31st, 2016 AFTER Obama sought the court order to tap the server Trump had in Trump Tower under the pretense it would prove links he had with Russia. That effort failed to produce any such evidence. 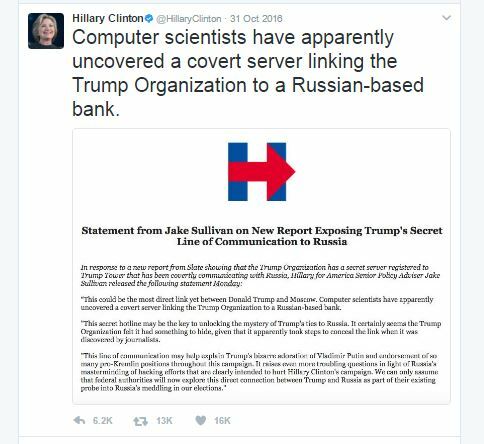 Here you have Hillary Tweeting about that very server that the Obama Administration applied for – not “scientists”. Hillary was briefed on the effort to use the Justice Department to target Trump for political purposes. This is Watergate all over. Any claims this was innocent national security means Hillary should never have been briefed. Plain and simple. This is an abuse of executive power. Why you think the Democrats can do no wrong and the Republicans are all evil, I think you have serious delusional issues.